ACDelco Wiper Blades have an all metal structure and are aerodynamically designed to have an anti-lift effect at high speed driving. 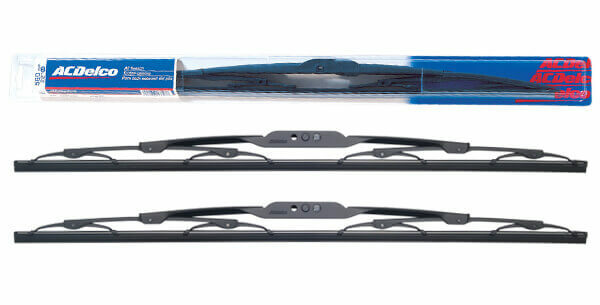 ACDelco Wiper Blades are coated for anti-corrosion, and use stainless steel rivets/pivots. The wiper blade spacer is designed to minimise friction among parts to improve wiping quality and reduce noise. ACDelco Wiper Blades come with multiple adapters to match most vehicle arm types for easy installation. Durability tested in weather conditions from -40°C ~ +80°C. Rubber is manufactured by three dimensional computer simulation design to maximise wiping, eliminate noise, increase life, and also improve flexibility by introducing specially treated natural rubber. All rubber blades are made of specially moulded and processed natural rubber and feature long lasting service life and high wiping performance. The wiper blade vertebra spring is assembled with rubber and stainless steel spring and distributes uniformed pressures to the rubber to keep the same wiping quality at any points.